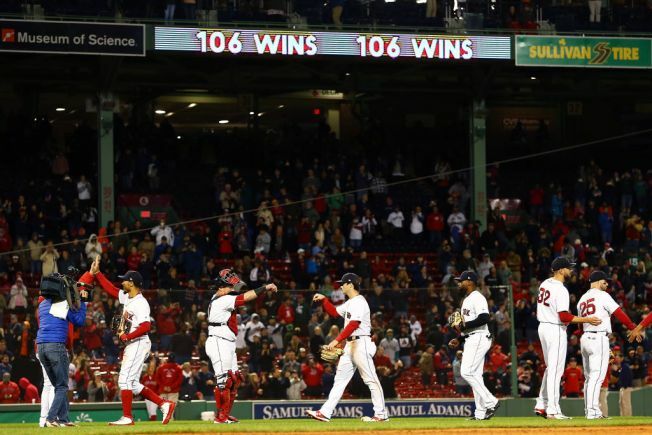 The Boston Red Sox broke a 106 year-old franchise record with their 106th victory on Monday night, clinching home-field advantage through the postseason by beating the Baltimore Orioles 6-2 thanks to a pair of hits from major league batting leader Mookie Betts. Nathan Eovaldi struck out 10 hapless Orioles batters to assure the Red Sox of the best record in baseball this season and home-field advantage through the World Series, if they make it that far. For now, they know they will open the Division Series at Fenway Park on Oct. 5 against the winner of the AL wild-card game between the New York Yankees and mostly likely Oakland. The Orioles (45-111) became the sixth AL team and the first since the 2003 Tigers to lose 111 games, falling 60 games behind Boston (106-51) in the division. It's the first time since 1939 that teams separated by 60 wins in the standings have played each other. Betts also singled and scored in Boston's two-run fourth, moving him into the major-league lead with 125 runs scored. In his last three games, he is 10 for 16 with three homers and four doubles, and he leads teammate J.D. Martinez (.328) in the AL batting race. LHP David Price (15-7) tries to bounce back from a rough start in Yankee Stadium in the second game of the series in what could be his last start of the regular season.